Caffeine and sugary goodness courtesy of Gimme! Coffee, Trumansburg, N.Y. Engineers are bred not born. Ok, maybe some are born as engineers. Maybe some come into this world with a silver planimeter in their mouth. If you don’t know what a planimeter is, I admire your youth, but you don’t know what you’ve missed: Hours of tracing, on paper (what’s that? ), just to have the machine skip off the page. Do over. And over! Good times!! I heard it a lot in my youth and throughout my career: “You’re smart. You should be an engineer.” Or, “You’re an engineer. You must be smart.” But how smart do you need to be to be an engineer? Smart enough to have picked a profession where I get to help people. Smart enough to understand that engineers solve problems, we don’t create them (hopefully). Smart enough to have chosen a college that taught me more than just theory. Smart enough to have worked with people who have challenged me and taught me well. Smart enough to have taken the best qualities of those around me and embraced them as my own. Smart enough to know that no matter how long we work, or train, we are never truly experts. Smart enough to know there is a lot I have to learn. Smart enough to surround myself with people “smarter” than me. Smart enough to know when I’ve been given good advice…and when to take it. Smart enough to understand the value of personal and professional relationships. Smart enough to keep my friends close and my enemies closer. Smart enough to know when it’s time to move on. Smart enough to know when I’m in over my head…and ask for help. Smart enough to see when it’s time to get out of the office, out of the house, and into the woods. Smart enough to partner with people who have strengths that compliment my weaknesses. Smart enough to admit that I have weaknesses in the first place. Smart enough to turn off my phone when I get home and not look at my emails. OK, on that last one, I’m actually as dumb as a doornail. Smart enough to know what a doornail is. Not really, I had to look it up. Smart enough to dress smart enough when it’s called for and not too smart when it’s not. 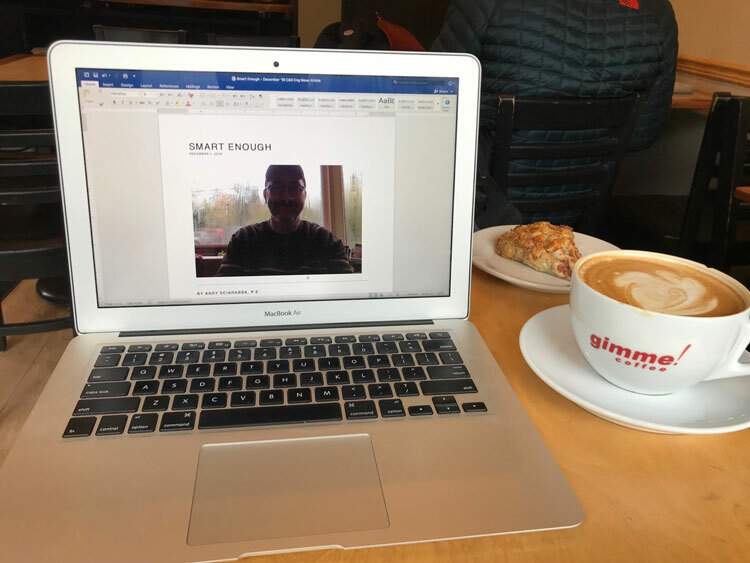 Smart enough to seek out a local coffee house on a rainy day to write an article on being smart. Smart enough to know when to stop typing “smart enough.” After all, “enough” is enough.